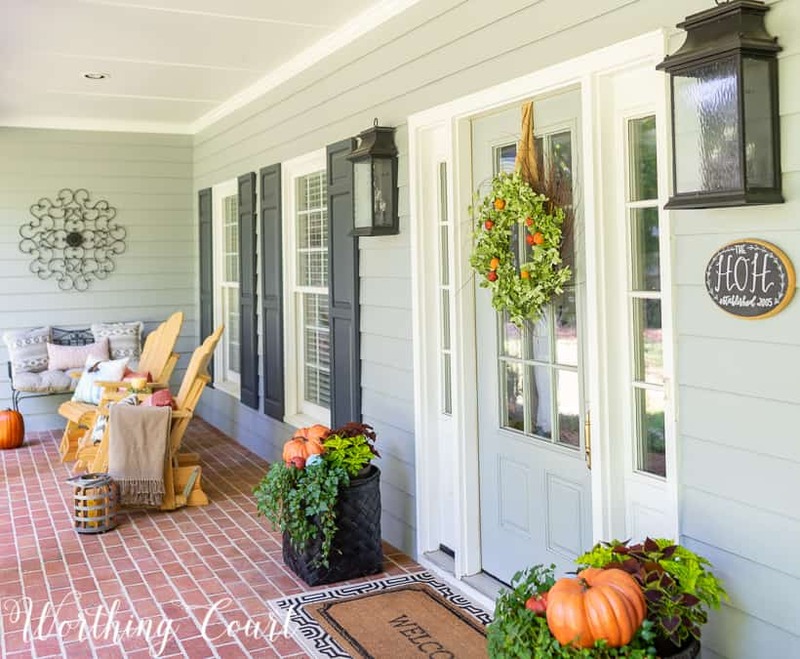 FALL DECORATING IDEAS FOR YOUR FRONT PORCH, FOYER, FAMILY ROOM, BREAKFAST ROOM, KITCHEN AND DINING ROOM ALL IN ONE PLACE! I’m honored to be joining over 20 of my blogging buds for a farmhouse fall tour blog hop this week! If you’re coming over from My Creative Days, let me welcome you to Worthing Court! You know, all of the seasons of the year have their own individual merits, but none of them can compete with fall. Fall is a welcome change from the brutal heat and humidity of a long, hot summer. Fall is a time of winding down and resting. A time to savor Mother Nature’s last glorious display before she completely goes into hibernation ahead of the seemingly endless stark, cold winter. 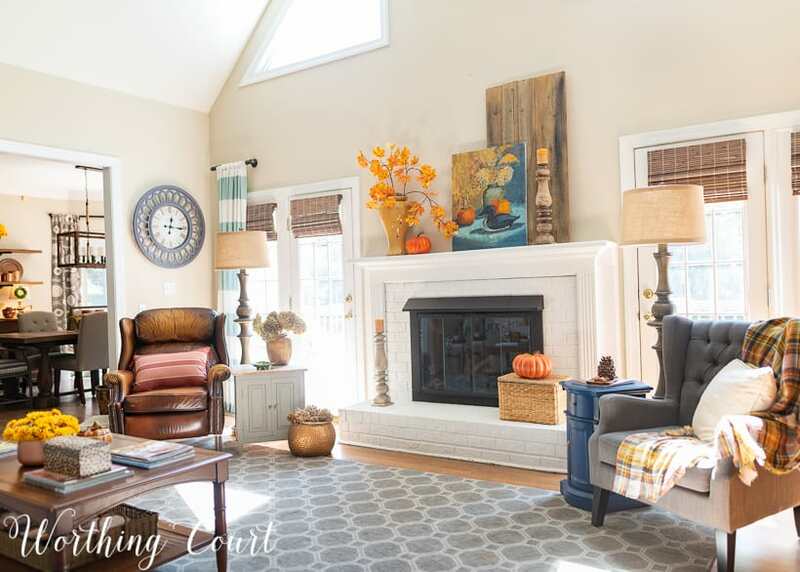 When I decorate my home for fall, I want it to envelope you in a welcoming cozy blanket. I want it to say, “I’m so glad you’re here. Come in, rest and sit by the cozy fire for a while”. I try to always decorate my foyer so that it sets the tone for the rest of the house. I feel like the colors and textures should be a small taste of what to expect as you meander from room to room. I typically use mostly traditional fall colors this season, but this year my inspiration came from a forgotten painting that was tucked away in my attic, so I’ve added a few touches of blue as well. 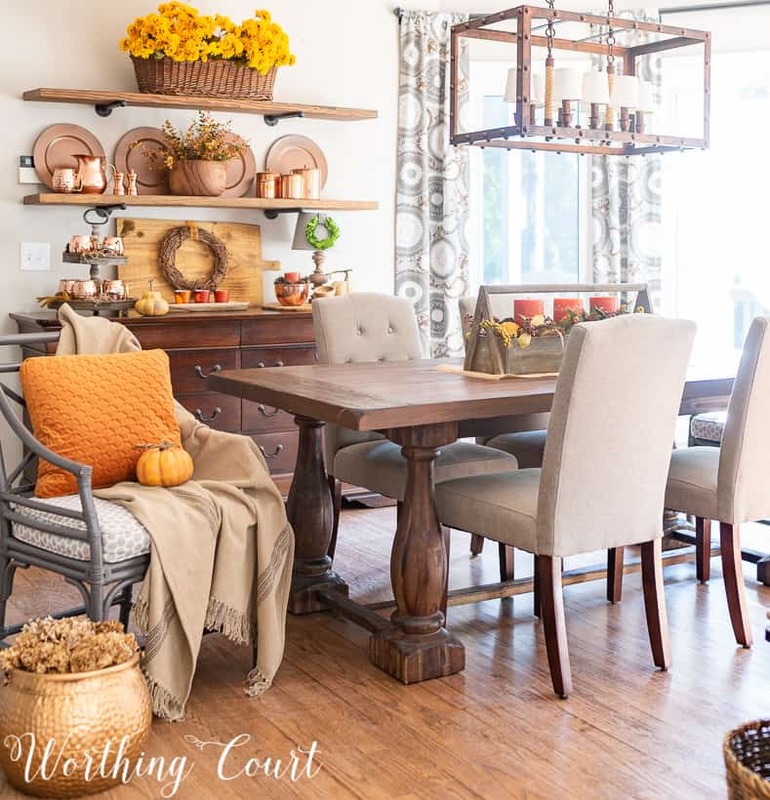 The departure from traditional fall colors is especially evident in my dining room, which you’ll see below. The foyer leads directly into our family room, where I kept the decor so much more simple this year than in years past. It’s a bit of a departure for me because I have a habit of trying to use ‘all the things’, but I must admit that I’m loving the simplified look. Maybe it’s a bit silly, but one of the things that I’m the most happy about is that I finally figured out styling for my coffee table that I’m satisfied with. I’ve really struggled to get it just right over the last few years. Bonus – it only takes a few minutes! You can see that there’s a wide opening from our family room, that leads into the breakfast room, where our diy shelves take center stage. They’re definitely a focal point from this angle, so it’s a must that whatever I display on them reinforce the rest of the decor. The breakfast room and kitchen are actually one large room, so any touches that I add there get pulled into the kitchen as well, albeit on a much smaller scale. 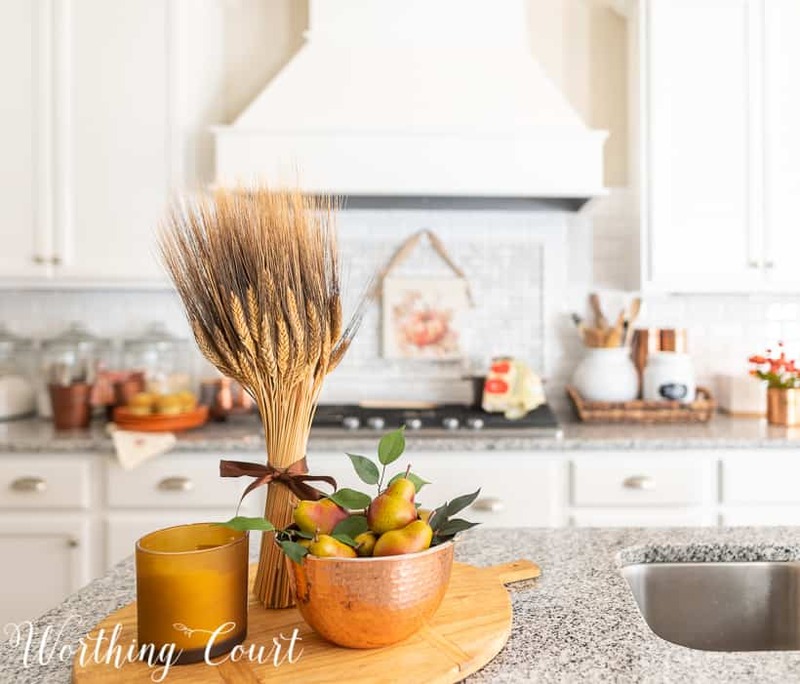 I don’t like a lot of clutter on my counters so just a few little touches will do. 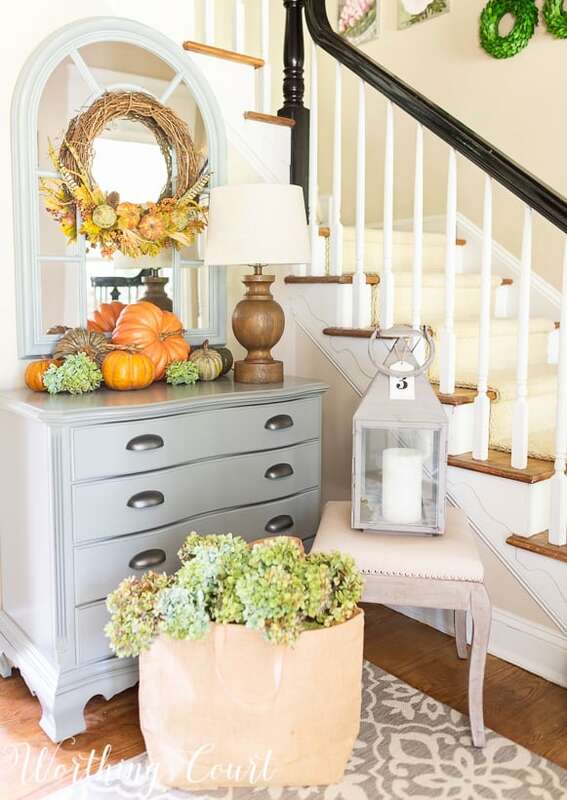 The entrance to our dining room is at the other end of the kitchen, where the fall decor is a bit of a departure from the rest of the house, but it ties in the little pieces of blue that I’ve sprinkled around the foyer and family room this season. 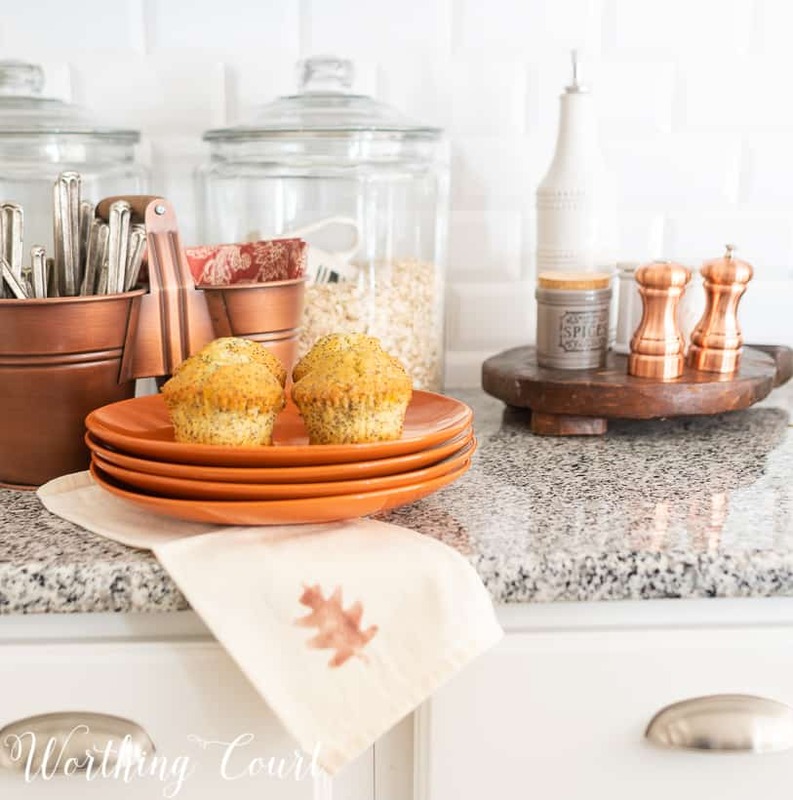 I haven’t shared this room decked out for fall yet, so I’m just giving you a little sneak peek today. Come back soon for the full tour! Thank you so much for stopping by today! I hope you’ll leave a comment to let me know you were here. Next up on the tour is Little Home Reloved. Don’t miss it because you’ll love her style! The links to the rest of the tours can be found below. Here’s a little preview of what’s to come! Every room looks beautiful!Love all the copper! Thank you, Ellen! Nothing better than copper for the fall! Your house tour was great! Thanks for sharing your lovely home and decorations with us. So glad you enjoyed it and thanks for stopping by! You’ve just got the most lovely home Suzy! 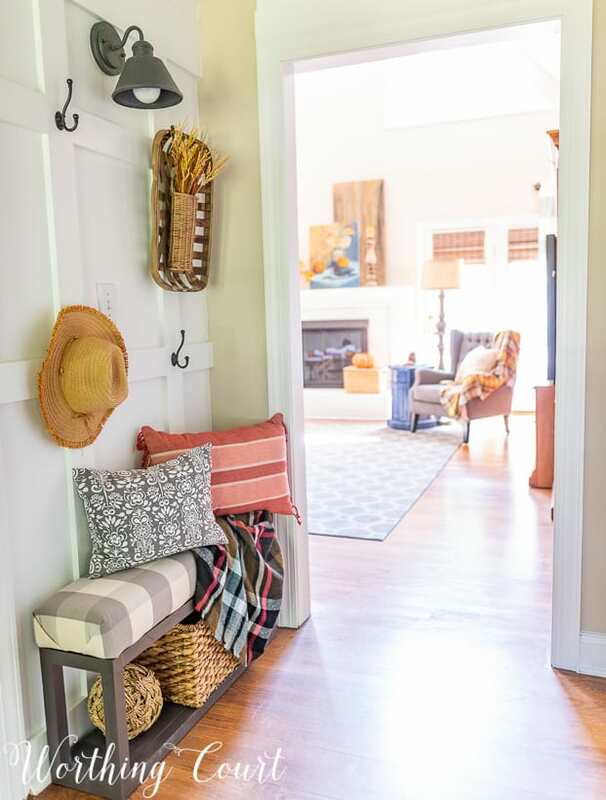 That porch is so dreamy and I love all of the warm pops of colour you’ve scattered throughout each space! Thank you, Kristi. It was fun being on this tour with you! Loved seeing the whole house. It all looks beautiful. I am enjoying touring the other bloggers’ homes as well. Thank you for sharing! Thank you, Traci. I’m glad you’re enjoying the tours! 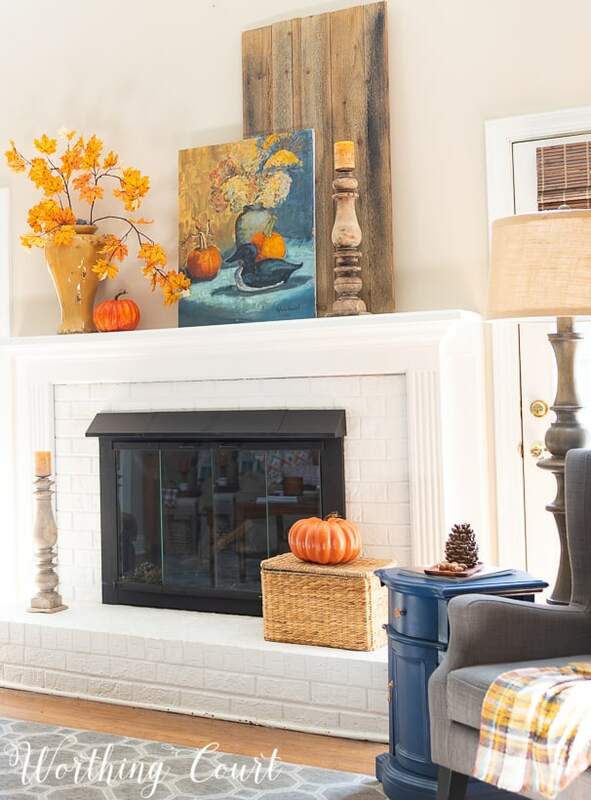 Your whole house looks lovely and “fall-ish”, without it being too much. I especially like the way some of the decor in the family room echoes the painting on the mantle. 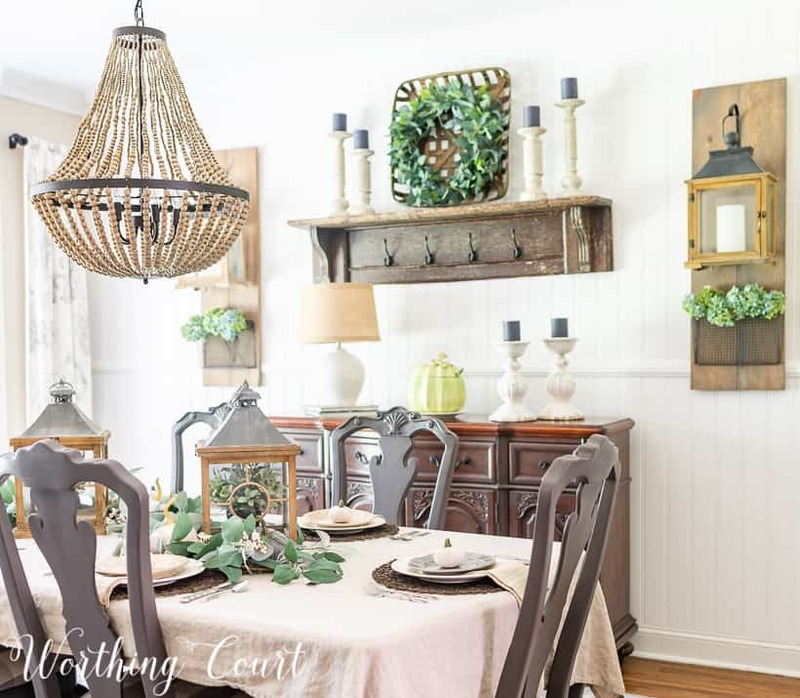 But then I also love the way the shelves and buffet in your breakfast room are styled and the copper accents in the kitchen and your beautiful dining room… guess I especially love everything! I’m so glad you like everything, Lurlie! Thank you for visiting! Your home looks beautiful! I love all of the fall touches. Thank you for sharing it with us! 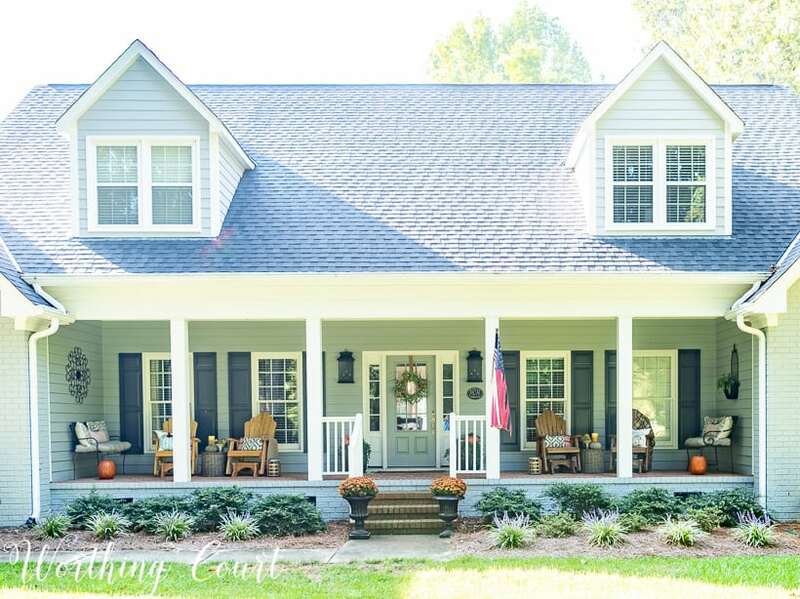 So many beautiful spaces and your porch is perfection! I love it all so much! It’s so warm and inviting and really speaks to the season. You did a beautiful job! So happy you liked everything! Thank you! Your pops of orange are so pretty! 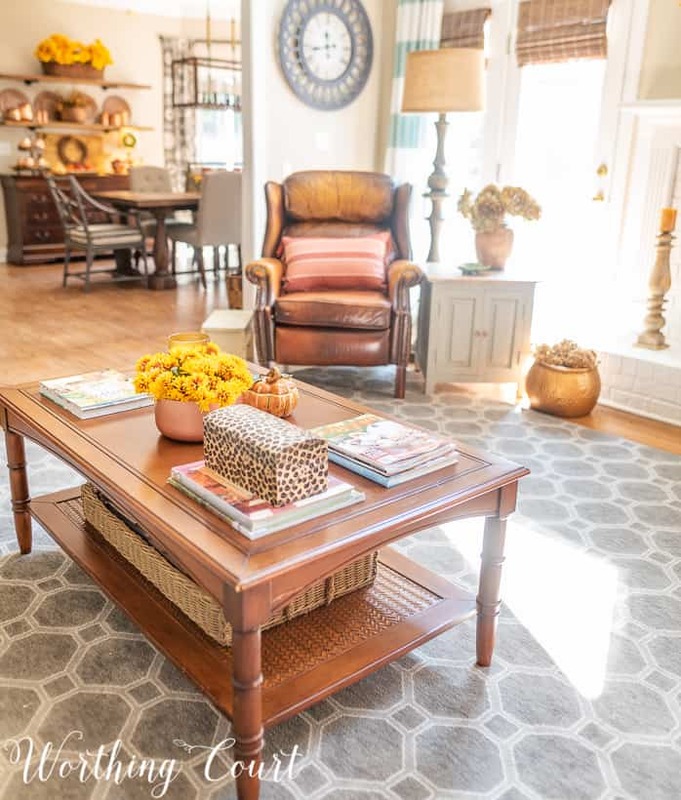 Love your coffee table ideas too! Love touring with you! Suzy, I love the way your decorating scheme flows from one space to the next. Everything looks so great together! I struggle with coffee table styling too, it’s either too much or too little. Yours is perfect! Thank you so much, my friend! Why are coffee tables so hard ? They should be easy! 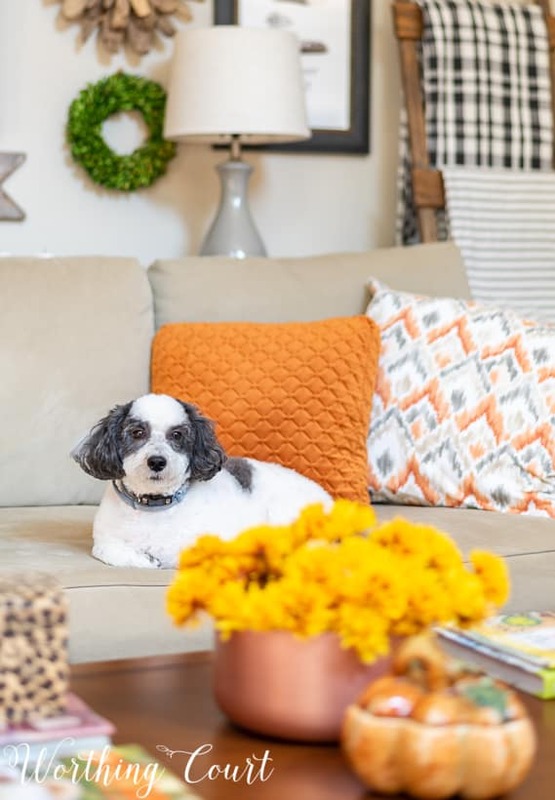 Always love your home tours, Suzy! 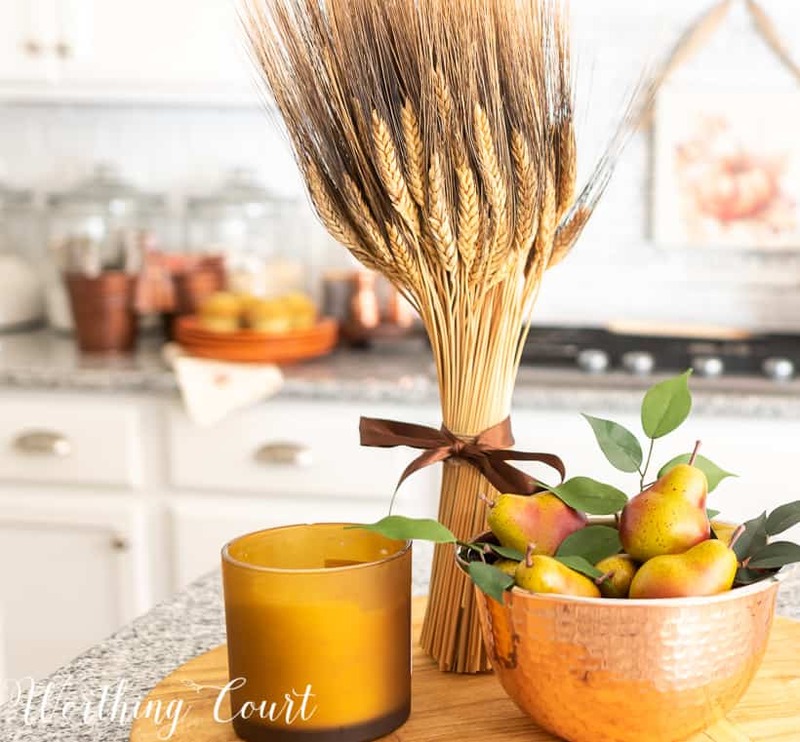 From your welcome porch to your entry and kitchen, every touch of fall is so lovely! Love the orange colors throughout… so fun to be in this tour with you this week! Your home is stunning, Suzy! 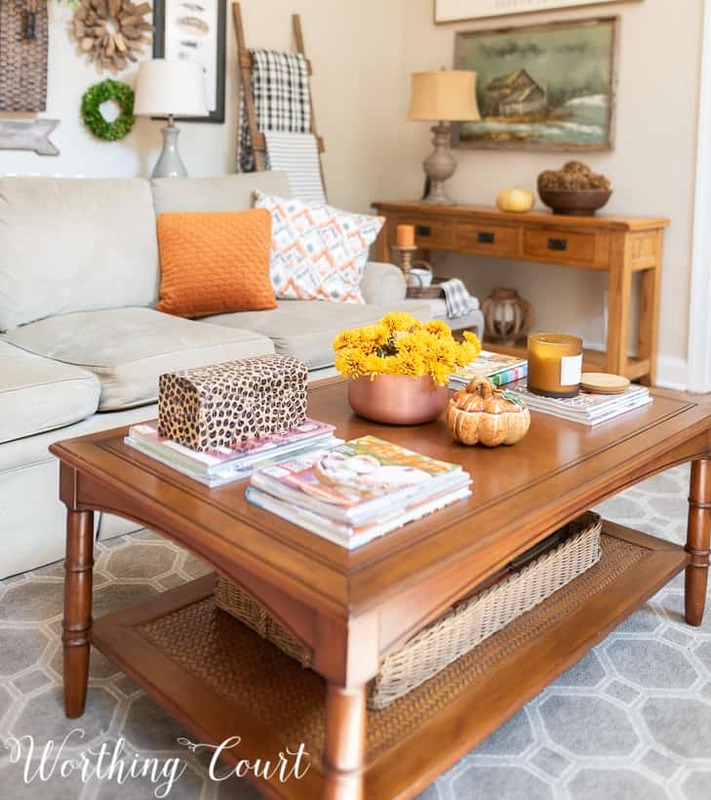 I love the warm colors you decorated with! Thank you so much, Jordan! Happy fall!